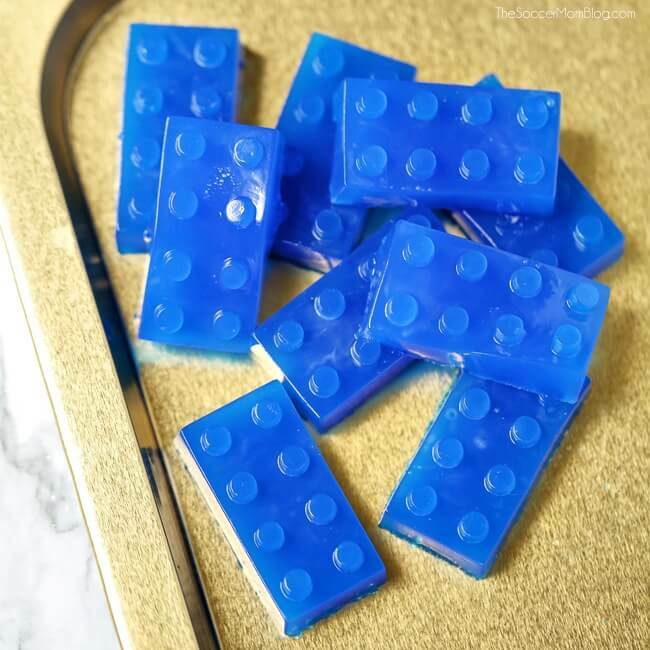 Make bath time a blast with wiggly, jiggly homemade LEGO jelly soap that looks just like LEGO bricks! 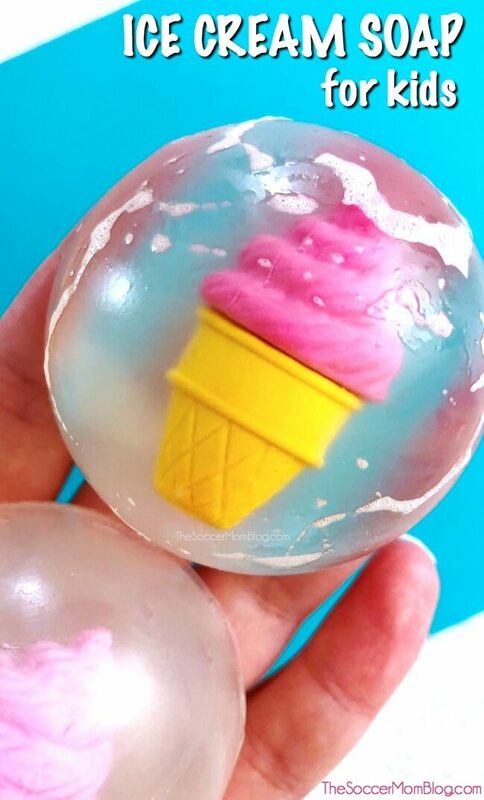 Bath time is a favorite in our house, and the girls especially love to use fun bath products — some of our favorites are bath bombs and play dough soaps. However, if you’ve ever shopped for specialty kids bath products, then you probably know how pricey they can be. So why not make your own? Perfect for your resident LEGO fan, or if you’re looking for ways to make bath time more enticing (for the kiddos that don’t like to take a break from playing). Even better, this recipe only requires 2 simple ingredients! So let’s get started! Related: Try our calming bath for kids – helps for easier bedtimes and restful sleep! For your convenience, I’ve included shop-able ad links to products used to make our jelly soaps. Our disclosure policy is available here. 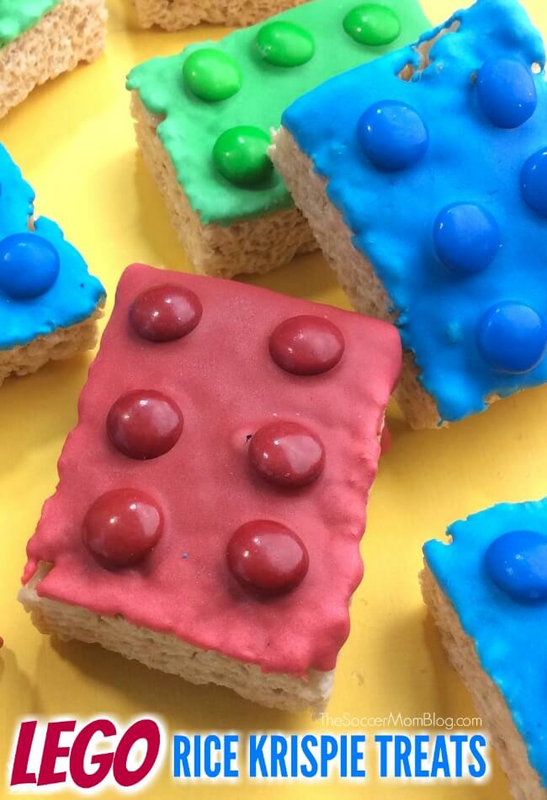 First, watch this 1-minute video tutorial to see how we made our LEGO soaps. Then keep reading for full photo step-by-step instructions. Cut jelly soap base into small cubes (about 1 inch square). You’ll need about 3/4 cup for this recipe. Place jelly soap cubes in a microwave-safe dish and heat in 20-second intervals, stirring in between, until smooth. SAFETY TIP: Handle with caution, as bowl may become hot. Since the soap definitely will be hot, adults should do this step for younger children. Stir in 5-10 drops of food coloring or soap dye. I recommend starting with a couple drops and working your way up until you’ve reached your desired shade – some dyes are darker than others, so you may need more or less depending on which you use. OPTIONAL: Add some flair to your LEGO jelly soaps by incorporating glitter or fragrance oil at this point. 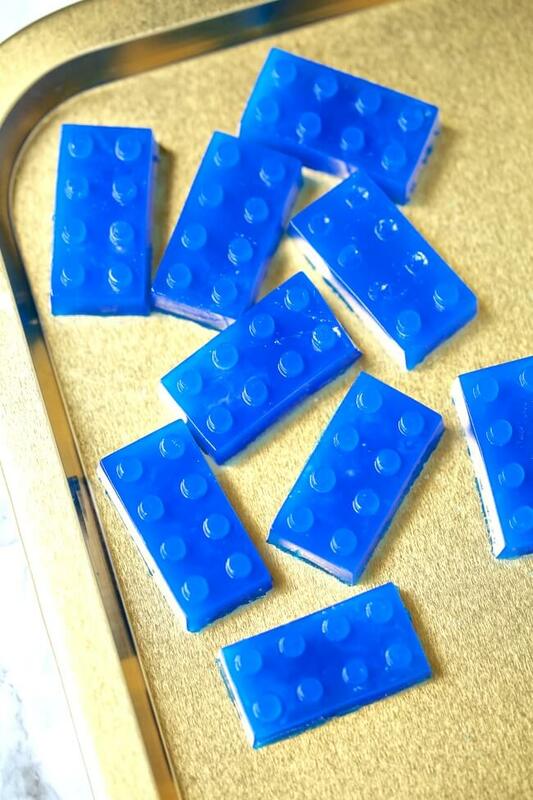 Lightly spray your LEGO silicone mold with rubbing alcohol (this helps prevent air bubbles in your soap). 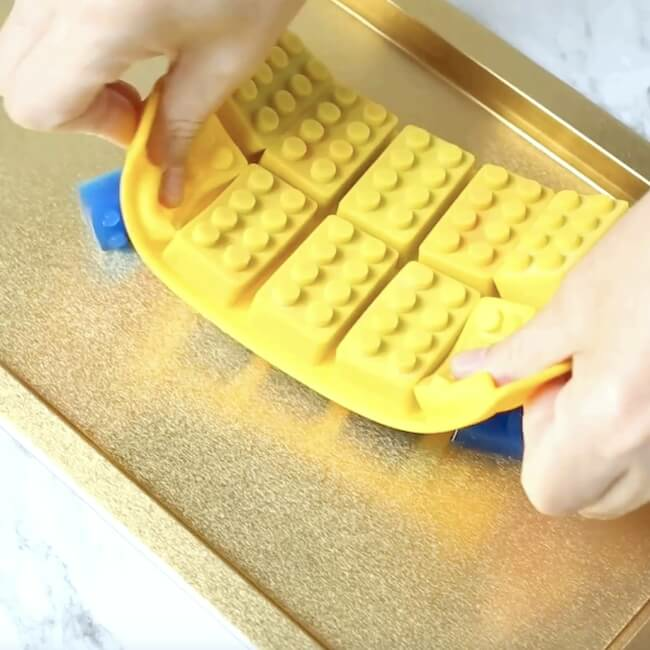 Place prepared silicone mold on a flat, sturdy surface and pour jelly soap mixture into each LEGO brick mold. Lightly spray the top of the mold and soaps with alcohol. TIP: Place your silicone mold on a cookie sheet so you’ll be able to move it to the fridge without spilling. Carefully transfer jelly soap mold to the fridge and chill for at least an hour, or until soaps are set. Pop your LEGO soaps out of the mold (silicone molds make it super easy!) Store in an airtight container in a cool place until ready to use. For more homemade soap ideas, check out these Glittery Gelatin Soaps from Sugar Spice & Glitter! Make bath time a blast with wiggly, jiggly jelly soap that looks just like LEGO bricks! 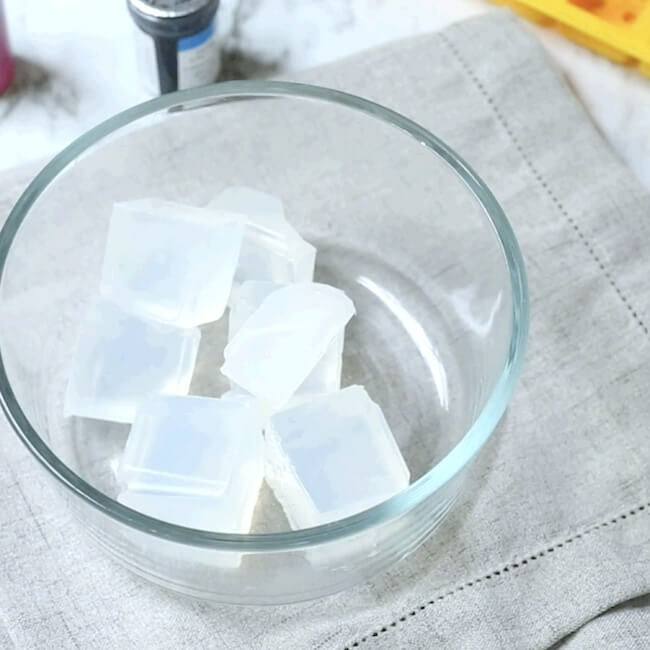 Place jelly soap cubes in a microwave-safe dish and heat in 20-second intervals, stirring in between, until smooth. Take care when handling, as bowl may become hot. Grown-ups only for this step! Stir in 5-10 drops of food coloring or soap dye. If using fragrance oil, add it now. 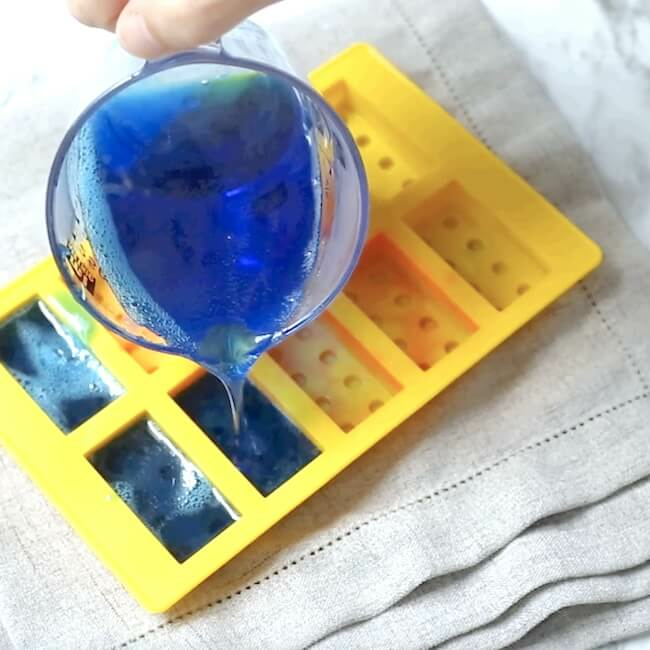 Spray your LEGO silicone mold with rubbing alcohol. Place prepared silicone mold on a flat surface and pour soap mixture into each LEGO brick mold. Spray the top of the mold and soaps with alcohol. Place your mold on a cookie sheet and move to the fridge. Chill for at least an hour, or until soaps are set. Pop your soaps out of the mold. Store in an airtight container in a cool place until ready to use.